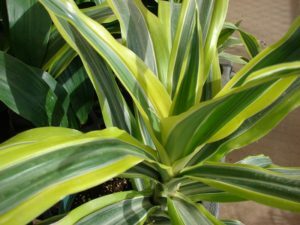 Houseplant of the Week: Dracaena | Warner Companies, Inc.
With the last season of Game of Thrones about to start, it’s a great time to talk about that Mother of Dragon Houseplants – the Dracaena. The word is Greek and roughly translates to “Female Dragon,” because of the red gummy resin that can be produced by the stems of the plant resembling, it’s said, dragon’s blood. Fortunately, the Dracaena doesn’t breathe fire. It’s even pretty easy to maintain. Dracaenas like filtered light or semi-shady spots. Never place a Dracaena in direct sunlight. They also require less water than most indoor plants. Mist their leaves, keep the soil slightly moist but also make sure it has good drainage (Dracaenas hate soggy soil as it can create root rot). A good rule of thumb? Let the top couple of inches of soil dry out before watering. Dracaenas are sensitive to temperature, preferring it to be about 65-78 degrees during the day and no colder than 55 degrees at night.